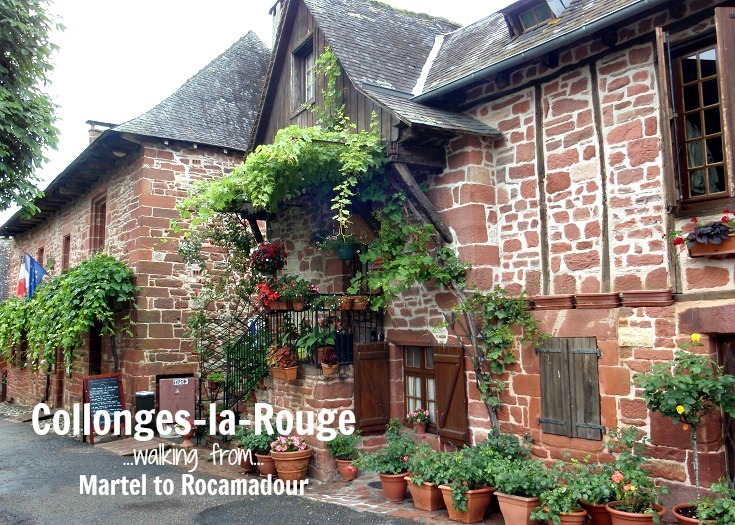 The second day of walking from Martel to Rocamadour brings you to the ‘most beautiful village’ of Collonges-la-Rouge. And since you’ve walked only six kilometres (less than four miles) from Turenne, there’s oodles of time to enjoy a leisurely lunch, poke around the backstreets and do a bit of souvenir shopping before deciding where to have dinner. 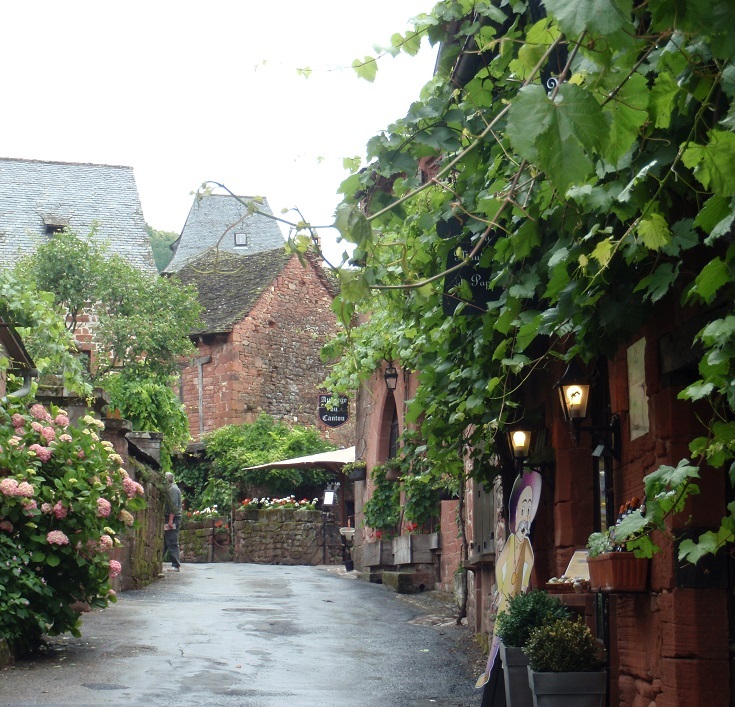 The village of Collonges-la-Rouge reveals itself slowly as you approach along the GR 480 walking path. Red brick spires and shiny slate roofs appear in the gaps between the trees, enticing you on. Can a village possibly be this pretty? Yes, it can! 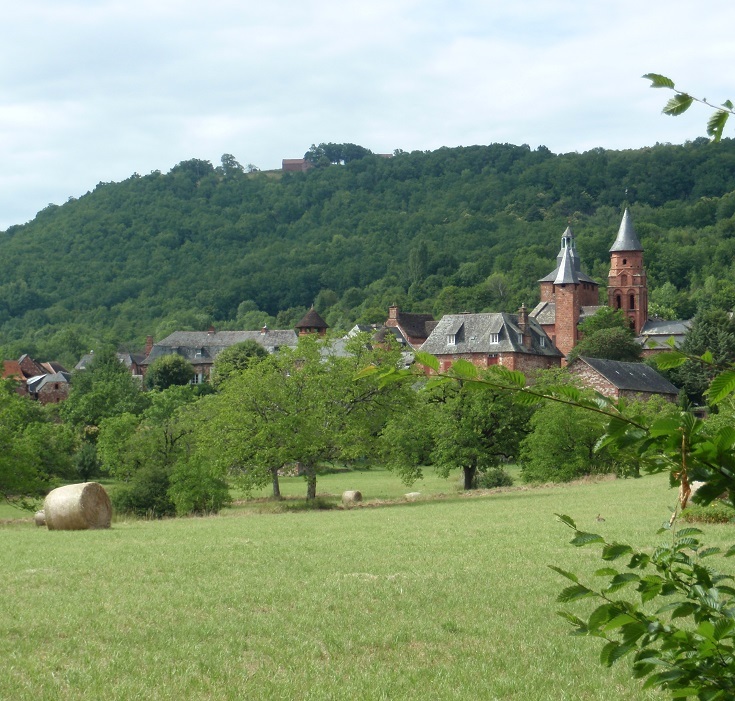 Collonges-la-Rouge takes its name from the Latin word for colony and the deep red of the local sandstone used in the construction of the buildings. The unusual colour and an abundance of flowers make every corner a ‘Kodak moment’ and long after you leave, images of the village will be instantly recognisable. The best way to start your visit is over a leisurely lunch at Auberge de Benges. Arrive early and choose a table on the edge of the terrace with views over the back garden and surrounding countryside. The food is superb and if it’s still on the menu, I can personally recommend the Anchaut de Porc Maison, Lentilles du Puy et Pomme de Terre aux Cèpes (ham steak, lentils and fried potatoes) which is so good I’ve had it twice! Luckily all the miles you are walking will soon dissolve those calories! After lunch, call in to the Tourist Office on the main street and pick up a map—marked with all the notable buildings and giving a brief history of each. As you wander through tiny alleys, you’ll pass the Halle aux Grains, or communal ovens, which date from the Middle Ages. This is where villagers gathered to bake bread, although nowadays, the ovens are fired up only once each year, on the first Sunday in August. 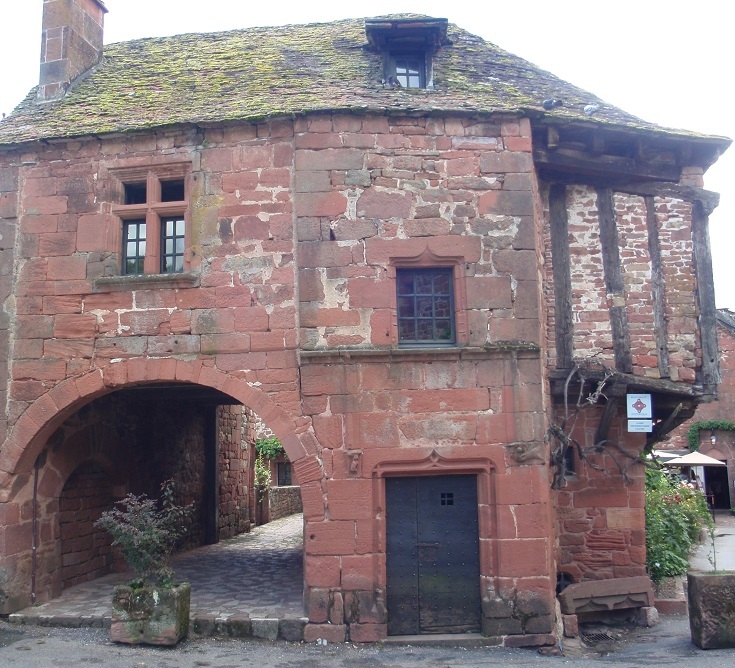 Back on the main street is la Maison de la Sirène (House of the Mermaid), now home to les Amis de Collonges (Friends of Collonges). This sixteenth century house features a carving of a mermaid to the side of the door—an unexpected sight in a village so far from the sea! There are over a dozen equally enchanting corners throughout the village and, if your French is up to it, guided visits leave from the Tourist Office (check the timetable here). 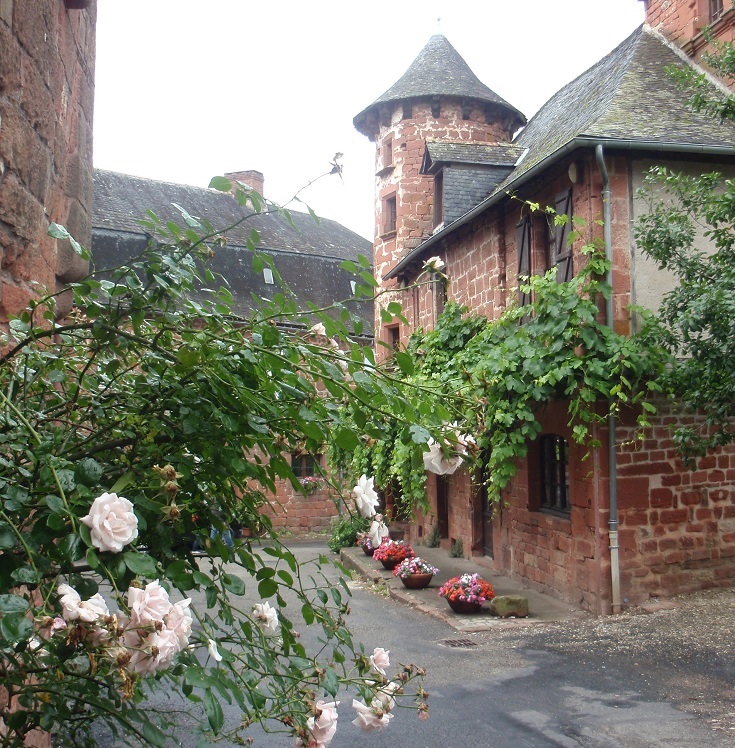 Collonges-la-Rouge was founded in the eighth century, growing around an abbey church built by monks from Charroux (240 kilometres, 150 miles to the west). The church has been renovated many times since then but the bell tower and tympanum above the door are both from the twelfth century. Close to the church is the Chapelle des Pénitents where the local villagers – who were not allowed into the abbey – worshipped. 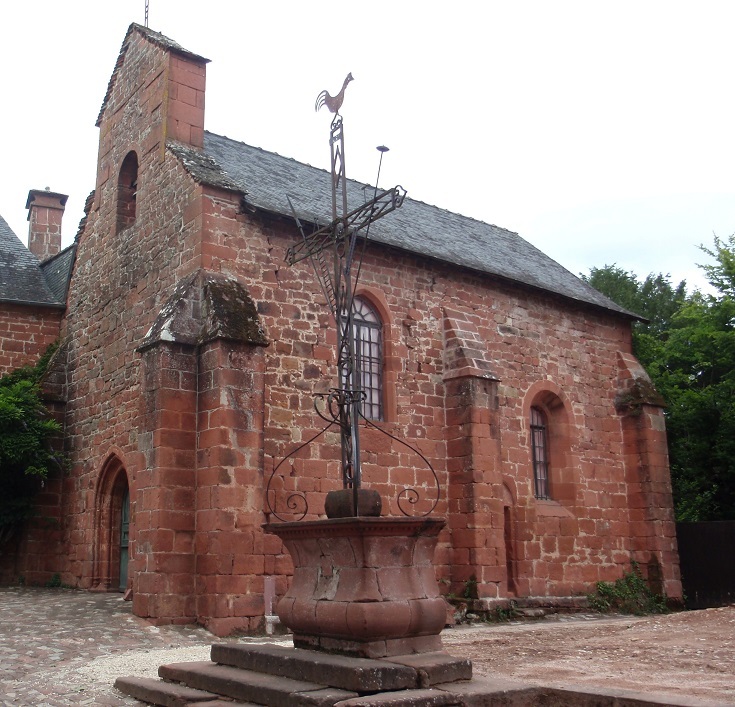 The chapel is no longer used for worship but houses an exhibition of events organised by the Amis de Collonges. Make sure you leave some time for shopping and take home a reminder of your stay. The main street is lined with gift shops which open in the tourist season – generally from April until September – and Mirjam’s, next to Chapelle des Pénitents, is a great place to start. There will always be room in your bag for a pair of earrings or yet another scarf! If shopping is not your thing, there are many cafés in Collonges-la-Rouge and finding a delightfully pretty corner to while away the afternoon will not be a problem. Of course, choosing just one – and another for dinner – could be! Collonges-la-Rouge is 6 kilometres (3.8 miles) from Turenne. I recommend making the most of a short day of walking to explore the village and spend the night here on the second day of your walk. You’ll find the Tourist Office on the main street of the village (on your left, heading uphill if you arrive from Turenne). Opening hours are listed here. There are more cafés in Collonges-la-Rouge that you could possibly hope to eat at in less than a week. They all look wonderful! My favourite, as you’ll remember from reading above, is Auberge de Benges. This is such a lovely walk. Our daughter will be spending some time with our family back home in the summer while we’re in Europe, this looks like the type of place we should explore during that time. Beautiful… on my bucket list for sure. It’s one of my favourites Manon and never disappoints!